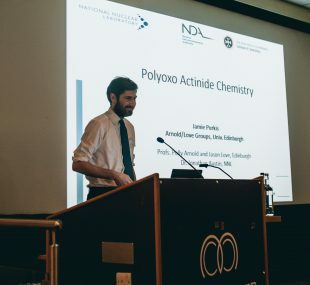 The NDA sponsors a wide range of PhD studies across UK universities – it’s a vital part of nurturing high-level skills for the decommissioning challenges that lie ahead over the next 100-plus years, and an integral part of our R&D strategy. Held in Manchester, this was the 6th annual bursary seminar for the students, providing an opportunity to share their progress with industry professionals, suppliers and academics. Sharing this knowledge at an early stage means those on the ground can begin to consider its potential for future deployment. Around 30 students made presentations and showcased posters about their work to the audience of around 100 delegates. The presentations varied from highly technical to the more human aspects of decommissioning work. Their enthusiasm was infectious, and as a recent engineering graduate just starting out in the nuclear industry, it was fascinating to chat with people who had chosen to extend their time in a university research environment by doing a PhD and focus on the fundamental aspects of technical challenges. I was impressed by the students’ knowledge and their ability to explain simply how the solutions they’re working on could make a real difference to the industry. Projects included work on characterisation, decommissioning, land quality, waste management and storage, and spent fuel and nuclear materials. Some focused on fundamental understanding of processes, while others looked at how established techniques or technology could be applied in new, novel ways. 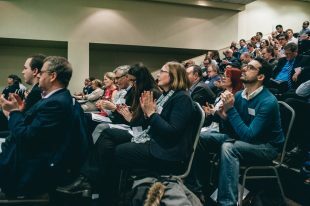 The day was also hugely valuable in building links between those with industry experience and those at the cutting edge of academic research, so a fantastic way to share knowledge. It was clear to see that the students understood the potential value of their contribution to the NDA's mission and really wanted to make a difference. The NDA spends £500,000 a year sponsoring PhD students and also funds their expert technical supervisors from the National Nuclear Laboratory (NNL). The supervisors provide them with insight into decommissioning challenges and help guide their projects, aiming for maximum impact across the estate. Bursaries for 2017-18 have now been awarded and students will be recruited to start work on the projects during the autumn. The pay-offs are apparent. Once their studies are complete, many of the students stay in nuclear decommissioning by entering the supply chain, joining the estate or continuing in decommissioning-related research in academic posts, delivering value for money to the NDA and maintaining key nuclear decommissioning skills for the future. These future specialists will be vital in developing innovative solutions from both the sites and the supply chain, helping us achieve our mission safer, faster and cheaper. The keynote speaker was Adrian Bull, from the National Nuclear Laboratory, who gave a talk on handling nuclear disasters and the lessons learned from Chernobyl and Fukushima. Adrian told of visits to both sites, and discussed his observations on the different responses after each incident, and the subsequent impact of those responses on public perceptions. His enthusiasm for communications in nuclear was clear! For me, the seminar confirmed the NDA’s commitment to skills development and to investing in fundamental R&D that will add immense value to the estate. 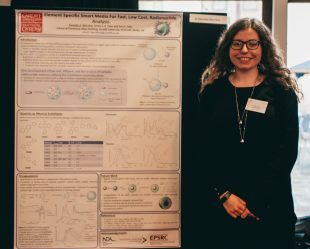 Danielle Merrikin won the prize for best poster presentation on the topic: ‘Element-specific smart media for fast, low-cost radionuclide analysis’ (Characterisation theme). Jamie Purkis won the prize for best oral presentation on the topic: ‘Controlled Uranyl-Catalysed Hydrocarbon C-H bond cleavage’ (Land Quality theme). If you or your organisation are interested in how NDA research is funded and how to get involved, check out the research section of the website. Read about a recent research conference in Leeds, organised by the Nuclear Waste and Decommissioning Forum.